Anyone who has ever chased after a wet dog tearing through the house, a child running from the bath, or has painstakingly scrubbed muddy footprints off floors, understands the genius that is waterproof flooring. It simply makes life so much easier when life gets a bit messy. If you have a busy, active household then chances are those messy moments happen more often than not. While waterproof floors are a logical choice for mudrooms, bathrooms, basements, or kitchens, Palmetto Road’s Tidewater Collection has such on-trend style that it is beautiful in any room of the house. High design and high function? Yes, you can have it all. The Tidewater Collection is designed after natural wood looks that speak to many styles of home decor. One of the most popular looks in contemporary design is weathered and aged hardwood, which is beautifully captured in Tidewater colors Toast, Bora Bora, and French Oak. This same rustic and timeworn visual is also found in Corral, Ancient Oak, and Cambria, offering a full range of shades and color undertones. Grays, browns, taupe, and whites are all blended to create the wood colors found naturally in driftwood at the beach, a weathered boardwalk, or a country barn house. Depending on the color, the effect can be dramatic and set the tone for how the entire room is styled. On the opposite end of the style spectrum from rustic floors is traditional wood floors. These colors and designs are tried and true. They are perfect for the person who prefers to keep their design classic. In the Tidewater Collection, colors Autumn, Fiji, and Fruitwood lean towards a traditional look, but still have the contemporary edge given the larger 7″ width boards. These colors offer warm hues with shading and texture more in line with classic wood styles. Distressed wood designs continue to be popular because they are a terrific blend of traditional and rustic styles; it is the happy-medium between designs. 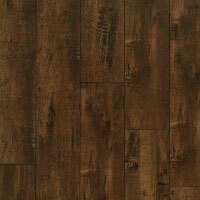 Distressed wood looks offer timeworn style, but without the dramatic weathered look of rustic floors. Distressed style isn’t as sleek as traditional, but it can easily anchor a traditional or rustic room design. 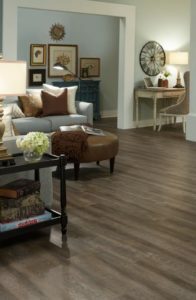 Tidewater’s Good Earth and Tide are the perfect choice for this style of room. These colors also offer the added design element of cut and painted beveled edges. What this means is that the edges of each board are painted so, the planks are more defined when they are laid out in a room. One homeowner described this feature as having the same effect as a matte around a photo. One of the great benefits of having such high style in a functional floor is that you can create a seamless design between rooms. The same wood look floor that creates a “wow” effect in your family room can flow right into your kitchen, laundry room, or down into the basement. When it comes to function, the Tidewater Collection is a workhorse. It is 100% waterproof and offers a lifetime residential warranty. These floors were made for your wet dog, soaked rain boots, and beach flip-flops. 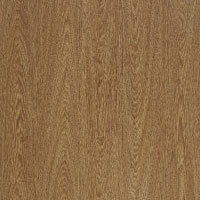 Although Tidewater has a wood look, there is no wood in the planks. 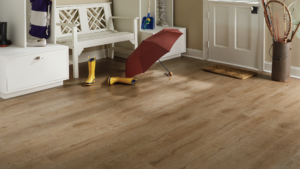 One of the most popular questions we hear is “what exactly is waterproof flooring?” It is a hard-surface, luxury vinyl floor with a rigid waterproof core. Each plank is made of three layers – a top ceramic bead wear finish, a 2mm top layer made of 100% virgin vinyl, and a 5mm extruded waterproof core. The combined 7mm creates Tidewater’s great durability. The 12 mil ceramic bead wear finish means it is easy to clean and extremely stain and scratch resistant. With its Unilin locking system, Tidewater is easy to install, however we recommend having the floors installed by a professional installer experienced in hard surface flooring. When installing, it is important to use the Palmetto Road tapping block which was specifically designed for our Tidewater Collection. All of Palmetto Road’s waterproof collections are FloorScore Certified and CARB II certified making it a certified environmentally safe product. For light commercial applications, the Palmetto Road Barrier 20 Collection offers added features for high-traffic spaces. To learn more about the Tidewater and Barrier 20 Collections and to view samples, please visit a Palmetto Road retailer near you.